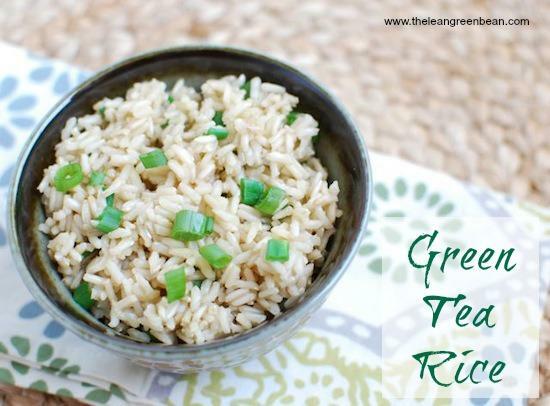 Add some flavor to your next batch of rice by cooking it in green tea! I’m not a very adventurous tea drinker. I basically drink peppermint tea when I’m sick and then several years ago I got on a green tea kick. Before I even started trying to get pregnant, I switched from the small amount of coffee I was drinking, to decaf green tea. That was my go-to for a while…and then I switched to just drinking hot water with grated ginger and a slice of lemon if I wanted something hot to drink. Now I mostly just drink water, but I still had a stash of green tea in the cupboard so I decided to use that for my recipe. I went the simple route this month. This recipe is nothing fancy. It popped in my head while I was cooking some brown rice for food prep a few weeks ago. Typically I just cook my grains in water, but I have occasionally cooked them in chicken or veggie broth for some extra flavor. I decided to try cooking my next batch of rice in some green tea to impart a subtle flavor and it worked perfectly! A simple side dish that’s lightly flavored with green tea. Brew the tea according to package directions. Add rice and brewed tea to a saucepan. This rice is great by itself as a side dish. You could also use it in a stir fry or a curry….pretty much anywhere you normally use rice! This is such a cool idea!!! I always think about cooking oats in different liquids… why not rice?! Totally #strangebutgood! I’ve made basmati rice with coconut milk before, and also chicken stock but green tea? This is so unique!!! love going the coconut route as well! That sounds lovely! I bet the flavour just adds that ‘something’ without being overpowering. yep! just the perfect amount of flavor! Brilliant take on this months theme. It helps that I love rice! Oh this is so interesting! I would have never thought of using brewed green tea to make rice at all. I love it! Wow, I have never thought about using tea for my rice. I am a HUGE tea drinker and this sounds awesome to spice up my rice a bit! I never would have thought of adding green tea into rice. What a cool idea! I love that idea! I’m not adventurous with my tea either. I usually drink chamomile at night before bed, but that’s usually in the cooler months. I think it’s a great idea to use in a stir fry. Great weekend dinner idea! Thanks! yes! would be delish with a stirfry! i love green tea. I really want to try this! I know this will be good because I loved the green tea oatmeal I made for this recipe redux! 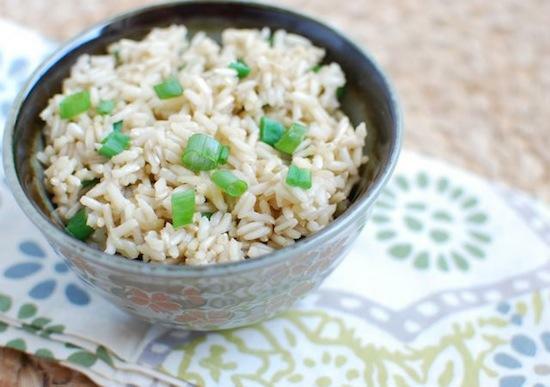 Rice will be up next – I thought your green onions were peas so now I’m thinking of throwing in some spring produce too. loved your oatmeal! so funny, i almost put peas in instead of onions! Great idea for adding some flair to bland rice. Love it!! Ok, this sounds SO GOOD!!! Must try. oh that’s a good idea too! Wow, I would’ve never thought to cook rice with green tea before! I’ve tried chicken stock before but never green tea. What a great idea! Oh how interesting!!! A few years back, I got in the habit of drinking green tea for the health benefits, but never considered using it as an ingredient or broth for a dish! Do the health benefits transfer? I’d think so… ooh I smell a dare coming on. Love this idea! I’m not much for tea itself, but I bet it’d be really good as a flavor in rice!! yeah! it just adds a nice, subtle flavor! What a great idea! 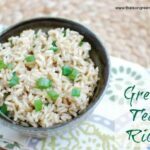 I’m sure you get some of the benefits of Green Tea infused into the rice as well! I’m digging super easy dishes lately so this is right up my alley! And, did you say with curry? Yes, please!!! I love this idea to give it a little extra natural flavor Lindsay! What is a recipe redux? Simple and clever! Love it. Yummy! I am always looking to make different flavoured rice! Love this!